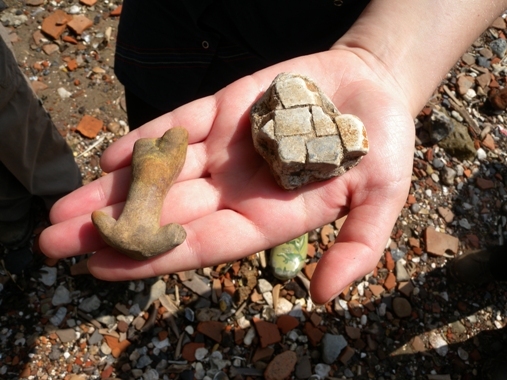 Thames Discovery Programme - Roman Offerings in Cannon Street? Roman Offerings in Cannon Street? Whilst taking part in the week long Archaeology of the Foreshore course in the first week of August, the group took a guided walk on the foreshore at Trig Lane, in front of St Pauls Cathedral and along under the bridges to the east. The stairways, defences and World War Two bomb damage provided a fascinating insight into the history of the city and the river and there were huge amounts of clay pipe and pottery of many different periods, including medieval and post medieval, distributed along the way. Some of this pottery had evidence of recent breaks, highlighting that it may have been eroded out of the foreshore very recently. This area is very close to Roman Londinium, was it a riverside shrine? The mosaic fragment could have been part of the floor and the figure may have been a votive offering. These were fairly common in Roman times, an offering to the gods for hearing their prayer. They come in the form of plaques, metal and clay figures, sometimes in the form of pipe clay Venuses which were often naked and on plinths. These differ from the figure I found as it appears to be made of a redder terracotta material, with evidence of it being made in two halves. This may make it of Gaulish (French) origin as figures there were mould made and constructed of this material. The arms positions, outstretched rather than against the body, could make it Aphrodite, or it might not in fact be female. Without the head and ends of limbs, its certainly a tricky figure to place! These votive offerings were often mutilated, and most found in the Thames have been bronze. 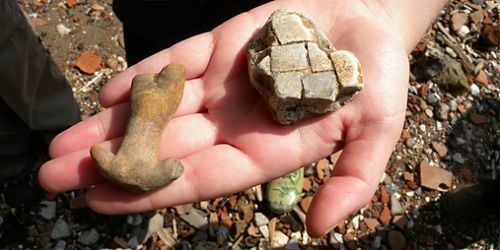 The Portabale Antiquities scheme website lists many small figures, including dogs, birds and gods, that have been found in London. I am planning to get mine recorded by the Portable Antiquities Officer, and it has given me a fascinating topic of research. If anyone has any suggestions of what the figure might be please do let me know.